Fourth Generation SediMeter • Lindorm, Inc. 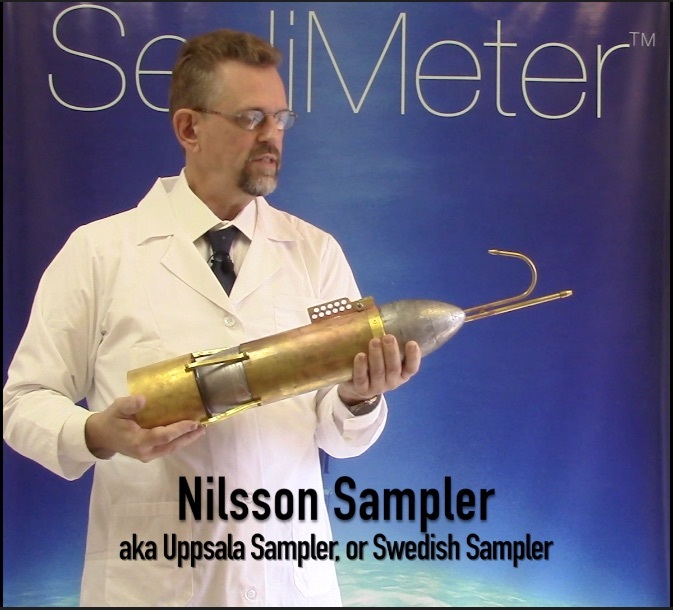 The SediMeter™ SM4 has the same sensor as SM3 for beload transport, erosion and sediment accumulation; plus nephelometric turbidimeters for suspended sediment transport; plus an accelerometer for detecting energy levels and for conditions based monitoring (CBM); plus UV anti-fouling; plus a fluorescence meter; plus a light meter for good measure. SM4 has the same SediMeter™ sensor as SM3, plus a thicker section with nephelometric turbidimeters, a fluorescence meter, a light meter, and an accelerometer. We expanded the top part of the instrument so that it does not enter the holder tube, since the holder tube adds reflections and noise to the turbidimeter measurements. Furthermore, we replaced the #37 optical backscatter detector with not one, but two nephelometric turbidimeters. Nephelometric means that they measure 90º scattered light, meaning that the light exits and re-enters the tube at different points, which further decreases the reflections and signal noise. The result is a SediMeter™ that is not just suitable for studying the sediment bedload, but also for monitoring the suspended load. We put in both a NIR (near infra-red) nephelometric turbidimeter based on the international standard ISO 7027 (with units FNU), and a white light nephelometric turbidimeter based on the U.S. EPA standard (with units NTU). They are coaxially mounted, meaning they measure the same volume of water. We also added a fluorescence meter that exites at 367 nm and measures visible light (peak 570 nm, 50% sensitivity from 470 to 680 nm). This detector is also used as a light meter. All of these measure at the same location. Another exiting addition is the accelerometer. Apart from alerting the operator if the instrument has fallen over, it gives information about vibrations. In strong currents (or waves) the instrument will start vibrating due to the creation of vortices. The accelerometer will record this, but moreover, it can alert the CPU and trigger an extra measurement. This conditions-based monitoring (CBM) will enable the SM4 instrument to measure the peak events. To avoid that the memory gets filled during prolonged vibrations, the threshold is dynamic. When the instrument is deployed the CBM threshold is by default close to the noise level. Thus, even small magnitude events should be picked up. Every time the instrument takes an extra measurement, it raises the threshold for the next CBM event. This should guarantee that the peak event gets captured. When a measurement is taken the accelerometer data is read from a FIFO (first in first out) cyclic memory. Thus, the CBM measurement includes the accelerometer data that triggered it. The accelerometer can be set up with different measurement rates, filtering parameters, and threshold, depending on the type of event that the user wants to capture. For instance, by measuring at a slow rate with a low-pass filter, one can target seismic events while ignoring instrument vibrations, and vice versa. To protect against bio-fouling we added UVA light to the turbidimeter windows. To protect the users eyes while working on the instrument in the laboratory, the UVA cleaning function is only active when the instrument is mounted vertically. We have also released SediMeter software ver. 4. Flyers, specifications, manuals, and software are available on the downloads page.